Next post: The Dewey Decimal Edition–a special personal finance edition! 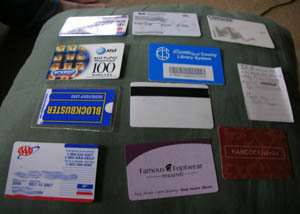 PT Money asked me and a few other bloggers, “What’s in your wallet?” Well, I can tell you it’s not Capital One. Though not for lack of trying on their end…yet somehow their incessant spamming of my real mailbox turned me off when I was looking for a credit card. Hmm. Maybe less marketing = better. This is my wallet. It’s not that exciting, nor was it particularly expensive. In fact, I feel like it came with a purse or something. It’s a little bulkier than I might like, but I don’t need to use it much so it works just fine for me. And this is what you see when you open it. My most-used cards and my license…isn’t my DMV picture great? It’s not too easy to get these cards out, but it works ok. My metro card, which I use most, is actually in the billfold because it spends so much time in my pocket. But it lives in here when it’s not in my pocket. So these are my big 4–my CVS card, my Giant card, and my old and new debit cards (both currently working, I’ll remove the old one once the account is closed). Also, in deference to my paranoia, I also have a card basically saying that if I’m in an accident people should call Micah’s number. I got the idea from my mom who has a whole list of medicinal interactions, allergies, and whatnot. With her cancer, for instance, adrenaline could send her into a shock. I don’t have anything like that, really, so it’s just a card for getting in touch with Micah because I’d want him to know. Inside the billfold, there aren’t any bills, just gift cards, my Border’s rewards card, my SmarTrip metro card, my library of Congress card, and a sticky note with the Dewey Decimal number of a book I was looking for. I probably shouldn’t keep some of those gift cards in the wallet. My worry is that I’ll end up somewhere without them. And as a bonus shot, this is what’s in my old college wallet…random stuff that’s no longer in date but that I haven’t yet gotten rid of. And another note about calling Micah. And, um, my old housemate’s library card. I should get that back to her. I have one of those “in case of emergency” cards in my wallet, too. And I printed one for my hubby. Since we live in earthquake country, I have the numbers for my parents and his brother (none of whom live in our region) on the other side. That way if we can’t reach each other, we can both call my parents and report our whereabouts and safety. Also about the emergency thing, I’ve always heard that you should have “ICE” programmed into your cell phone. It stands for In Case of Emergency and apparently emergency responders know to look there for who to call. I have my parent’s home number, dad’s cell and mom’s work all in there so that they’ll have options. You said that you shouldn’t keep those gift cards in your wallet in case you end up somewhere without them… do you go places without your wallet? I meant that I don’t want to take them out in case I end up without them. But I don’t think I should leave them in there in case they get lost or stolen…there’s no point unless I’m actually going somewhere. I like the In Case of Emergency letter. I use “ICE” on my cell phone, but a letter isn’t a bad idea! I have an emergency letter, too, although mine’s quite a bit longer: name, address, blood type, OHIP number (OHIP is the Ontario healthcare system), fatal allergy info, permission to perform cpr, and about six different phone numbers to call. It may be a bit paranoid… but then again, it may save my life one day. (Especially the allergy bit: if I’m hit by a car or something, it’s important that the EMS people don’t give me any penicillin, because I’ll die). I am not a big fan of purses, as I have forgotten them in far too many restaurants! Nothing like tracking down your lost purse repeatedly. So I try to fit everything into my pockets. Needless to say, I have pared down what I carry! Licence, charge card, debit card medical card. Oh, and emergency identification. 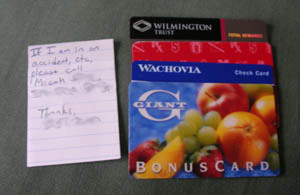 2 Credit cards (one is a gas card), 1 debit card, around $15 cash, license, business cards, Supercuts card, old student ID, library card, photo, stamps, notes from an old acquaintance, Giant card, office cafeteria card, EAD card, an expired debit card, someone’s address I had noted down a year back, some directions, grocery list from a couple weeks back… wow.. thanks for the post Mrs.M, I gotta clean up my wallet soon ! My wife loves Borders. Fortunately she doesn’t go there all that often because she knows she’ll end up spending more money than what she thinks. My daughter uses this: http://tinyurl.com/22s4ta She wears it criss cross, has all the cards she might need, some cash and her cell phone. Very compact! 🙂 I try to travel light. Wonder how much one of these darn club cards weighs, anyway? 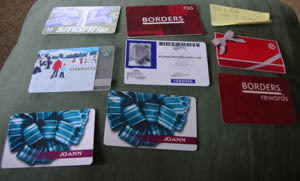 Mrs M – you have a heap of reward cards. Inside my wallet – debit card, gym card – too many receipts and a heap of change. You may also want to keep a short list of what is in your wallet! I keep one in my car and one at home…have you ever lost your wallet or had it stolen..it’s amazing how you forget EVERYTHING when you are in a panic. Plus, you’ll have all the numbers handy of your bank and credit card companies so you can call them immediately. Excellent suggestion, to have a list. It’s a good idea to photocopy all the cards in your wallet, front & back. Keep the copy in a safe place–maybe somewhere other than home, so if you have a fire or a really thorough burglar, you can quickly find all the cards, account numbers, & phone numbers. Here’s what’s in my wallet. Well You are showing things of your wallet. 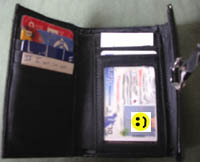 It is good in that perspective that people know that how can they fix their small things in their wallets.